An epic 35 day trip between Freetown, Sierra Leone and Accra, Ghana. 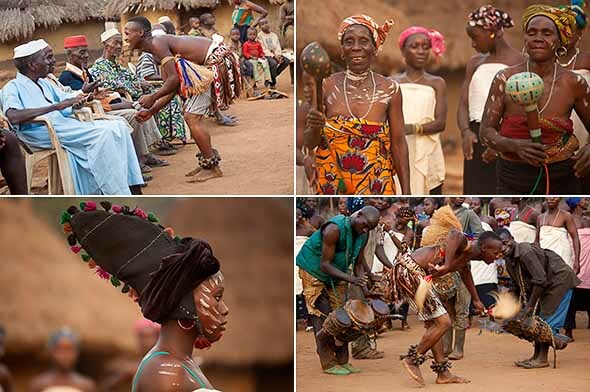 Experience the best of West African culture, music & dance ceremonies, vine bridges, wildlife, pristine beaches and traditional architecture on this off the beaten track adventure! Spend 2 nights at Tiwai Island Wildlife Sanctuary, home to the rare and elusive pygmy hippo. Overnight in a village in eastern Sierra Leone learning about the peoples culture, traditions and everyday life, topped off with story telling from the village elders and music and dance performances! Trek in Guinee Forestiere to find the vine bridges the area is famed for – walking on them is at your own discretion! Overnight at a beautiful traditional village in Ivory Coast and see a stilt dancer in action! 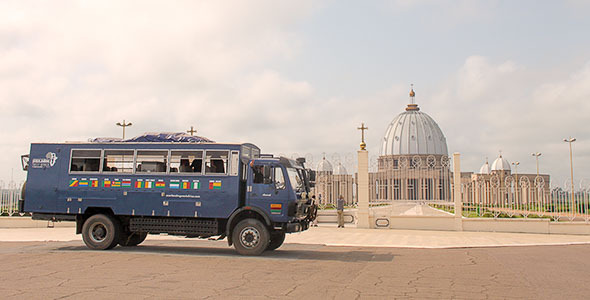 Visit the weird and wonderful capital of Ivory Coast – Yamoussoukro – and marvel at the basilica! Soak up the beaches, nightlife, music and unique atmosphere of Freetown, the buzzing capital of ‘Sweet Salone! Marvel at the modern architecture, skyline and museums of Abidjan, and party until dawn to coupé-décalé or Ivorian reggae! This unique trip is perhaps our most exciting. In 2012 we were, to the best of our knowledge, the first ever truck-based overland company to devise, market, sell, and then travel this route, and the first company to ever take an overland truck-based trip through Sierra Leone. We’re pleased to say it was a huge success! 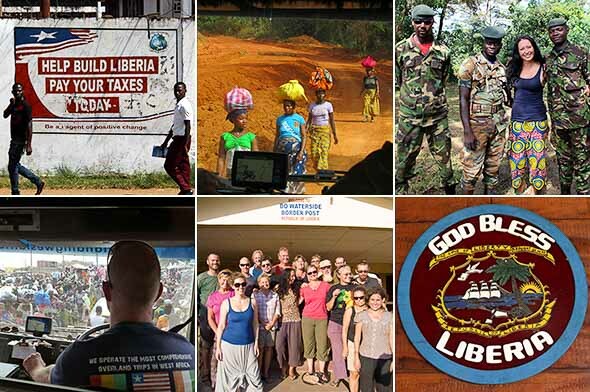 In 2013 we were the first ever truck-based overland company to go through Liberia. We’re pleased to say our hard work paid off! The trip was another huge success with everybody glowing about how wonderful Liberia is. This is truly off the beaten track – overlanding through a stunning part of West Africa few others get to see! Road conditions will inevitably slow us down so we have built extra time into the itinerary to account for this. 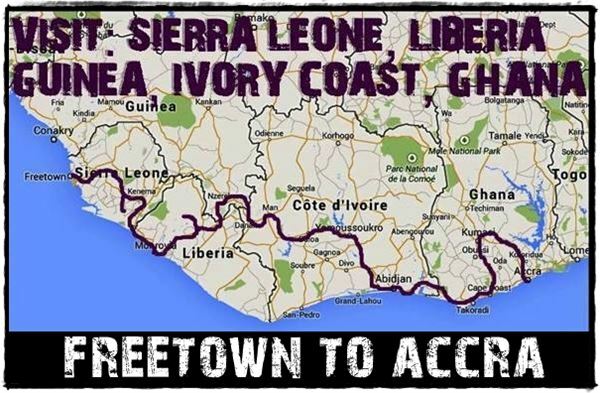 It will be tough going for short stretches as we journey between Sierra Leone, Liberia, Guinea and Ivory Coast. We’ll be driving through remote areas where there simply is no tourist infrastructure – so we’ll be bush camping off the truck for a few days at a time. Team work is the key to keeping the truck moving and group morale high! Corrupt officials are part and parcel of travel in this region. Delays at borders and checkpoints are commonplace. It can be tiresome but also quite comical sometimes – you just have to play the game! Security note: We will be monitoring the Foreign & Commonwealth Office travel advice before we set off and when we are on the road. We also have contacts on the ground who will let us know if the situation changes further ahead and we can re-route accordingly. We are happy to say that there have been no travel restrictions in place for any of our route for some time now. We start this leg of our journey in Freetown, where you’ll have time to look around and soak up the atmosphere in Sierra Leone’s capital. You could take a speedboat to Banana Island with its breathtaking views of the coastline, visit Charlotte Falls and/or the Tacugama Chimpanzee Sanctuary or simply beach hop along the peninsula. When the sun goes down Freetowners like to party – so if that’s your thing you’ll find plenty of beach bars and nightclubs to dance in until dawn! From Freetown we’ll head east towards Bo and onto Tiwai Island Wildlife Sanctuary. This reserve is home to 11 species of primates as well as the rare and elusive pygmy hippo. Here you can explore the island by foot, motor boat or dugout canoe, enjoying the river and forest wildlife whilst searching for signs of the secretive hippos. Nearby we’ll have a chance to cool off in a swimming hole, take fishing trips on the river, learn about local customs and agriculture and visit a neighbouring community for a music and dance performance. Leaving Tiwai Island behind we’ll spend some time in Kenema, a town made famous by the diamond dealing trade. The tar runs out here as we head south on some of the most challenging roads on the entire trip as we journey towards the border with Liberia. To experience the magic that Sierra Leone has to offer watch this superb video that Jamie Noel made for us. Jamie joined one of our trips in 2012 and made a series of videos highlighting the pristine beaches, friendly people and stunning landscapes the country is so famous for! The roads from the east of Sierra Leone to the border with Liberia are in a poor state, so our progress will be slow at times. It’s a beautiful drive through the jungle as we travel through a part of West Africa few other travellers get to. As we cross into Liberia the road improves for the journey into the capital, Monrovia. We will spend time in and around Monrovia as we apply for visas for later on in the trip. Despite being in a varying state of repair after so many years of upheaval, the city is very much moving on and building for the future. The people in Monrovia are particularly welcoming and always curious and pleased to see tourists coming to their city! Here you can marvel at what remains of the Masonic Lodge and other reminders of Monrovia’s most intriguing history. Whilst we wait for visas we will stay at a surf retreat along the coast. 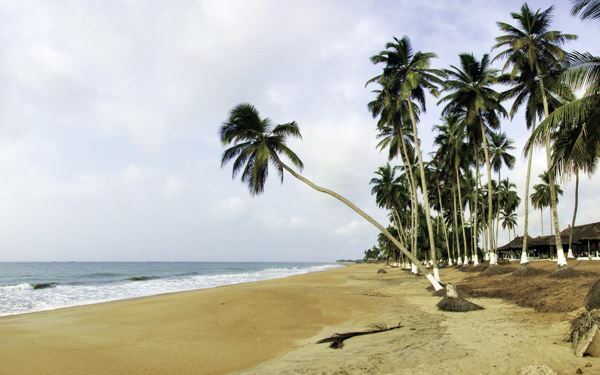 Here you will have the chance to enjoy the beaches and recharge after the challenging drive in from Sierra Leone! With visas in hand we’ll head north towards Gbarnga before continuing onto Guinea. This is a totally flexible part of the trip, as Liberia is very much new to travellers after being closed for so long. We will take it as it comes! The roads are in a varying state of repair, and could slow us down, so we have built spare days into the itineraries to account for this. 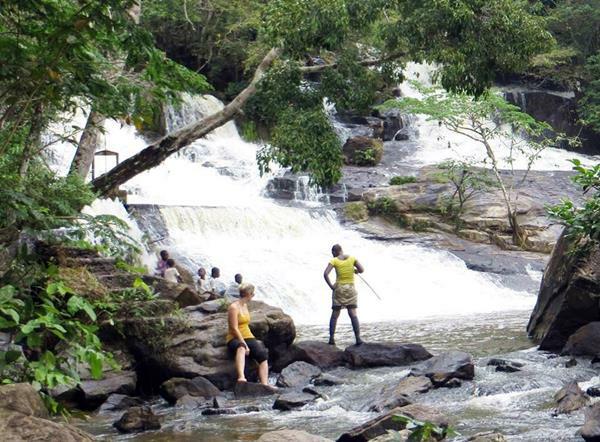 We will visit Kpatawee waterfalls en route, one of Liberia’s most beautiful spots, where if you wish you can spend a few hours trekking up the river to see a number of falls rising up the hillside. 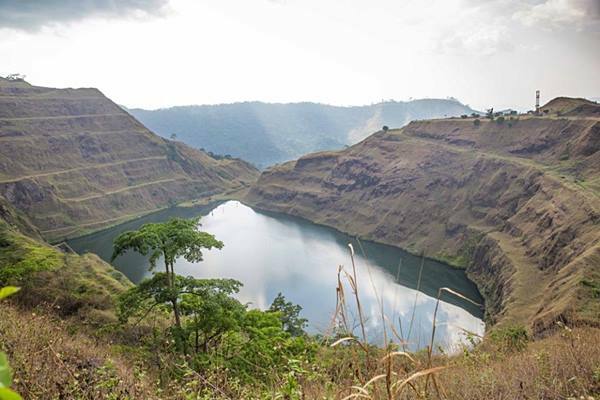 In the Nimba region we hope to visit the huge rusting relics of a long abandoned mine, against the backdrop of a modern purpose built mining town. You will be travelling through a remote part of West Africa, an area not accustomed to seeing a large group of overlanders before, so expect quite a welcome as we journey through this beautiful part of Liberia! This week’s itinerary is left deliberately vague due to the nature of the area we will be travelling through. Guinea Forestiere (Forest Region) and much of Liberia is remote, and receives far fewer visitors than other parts of the region. It’s one of the most naturally beautiful parts of West Africa, but travel in the region is somewhat challenging due to varied road conditions. Hike in the Guinea Forestiere to find the vine bridges the area is famed for – walking on them is at your own discretion! 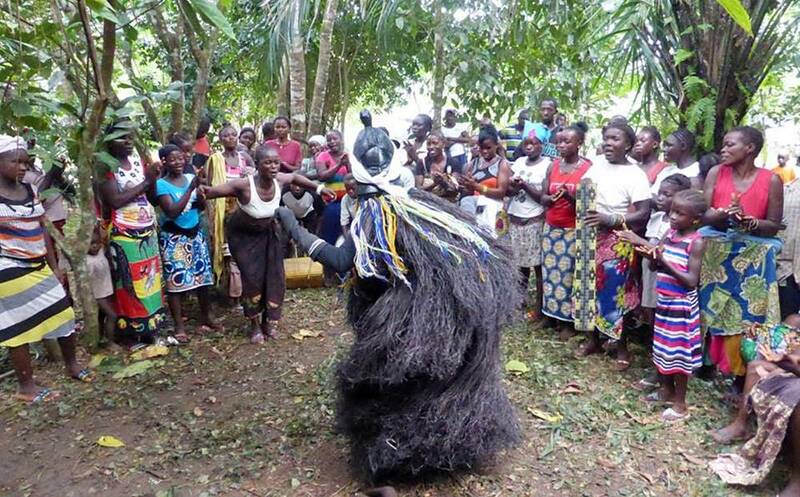 Explore the markets of Nzerekore and perhaps look around the Musee Ethnographique, home to a selection of masks and fetishes. We plan to enter Ivory Coast close to the Liberian border and head east towards Yamoussoukro. On our way we’ll spend the night in a traditional village where we’ll get to witness an evening of dancing and festivities. This village is picture post card perfect with some of the friendliest people we’ll meet on the entire trip. With luck the traditional dance will include a stilt dancer! To reiterate: this section of the trip is totally flexible due to unpredictable road conditions and security. Calm has most certainly returned to this particular area since recent conflicts ended, but your security is paramount so we don’t want to make any cast-iron guarantees regarding the exact route until the trip arrives region. Either way, we will have journeyed from the Forest region of Guinea to the west of Ivory Coast by the end of week 3. After our night in a traditional Ivorian village and hopefully having witnessed a stilt dance ceremony (see the video close to the top of this page), we head east to one of Africa’s anomalies – Yamoussoukro. The capital of Ivory Coast in name alone, Yamoussoukro was the hometown of long serving post-independence President Felix Houphouet-Boigny, who spent huge amounts of money to make it the new spectacular capital. We’ll spend two nights just outside of town – giving you a chance to marvel at the Basilique de Notre Dame de la Paix and the grand hotel with sweeping panoramic views over the cities dramatic skyline. Despite such a low percentage of the population actually being Catholic, the President spent hundreds of millions of dollars on a grand Basilica, almost an exact replica of St Peter’s in Rome! The town itself also boasts 6 lane highways that lead nowhere, grand hotels and various monuments, but all in a relatively small settlement of approximately 250,000 people. A surreal place that has to be seen to be believed! On our Freetown to Accra trip we lend support to an NGO called C.R.E.E.R (Centre de Reinsertion et d’Education pour les Enfants de la Rue), based in the town of Abengourou not far from the border with Ghana. This project has been set up to help trafficked children who have been forced to work in the cocoa plantations, gold mines and domestic service. The project is currently in the process of constructing their new premises, a hugely exciting time for all involved, and we hope we can make a positive contribution to such a worthy cause. We will make a financial donation to the project as well as bringing various supplies out from the UK/France on the truck. Next we head south to Ivory Coast’s bustling economic capital, Abidjan, with its stunning skyline and modern architecture, which may come as quite a shock after our journey through more remote areas over the past few weeks! In ‘Babi’ are some interesting buildings and museums to visit as well as the chance to stock up on luxuries. Abidjan really comes to life at night, and we will spend a night here to sample some of the great local music, including Ivorian reggae and coupé-décalé. 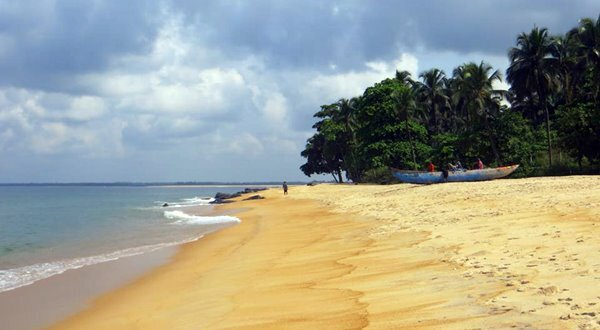 From the capital a short drive east brings us to Grand Bassam, the former French colonial capital in Ivory Coast. This sleepy town feels a world away from the hustle and bustle of Abidjan, where you can wander around the grand old colonial buildings, visit local artisans at work or simply kick back and relax on the golden sand beach. A drive day and hectic border crossing sees us leave Francophone Cote d’Ivoire for a chance to speak English again in Ghana. Our first stop, Ankassa National Park, boasts the greatest biodiversity of any reserve in Ghana with over 800 plant species, 190 bird species and 70 resident mammal species. We’ll have a chance to go trekking amongst the dense rain forest on the lookout for some of this elusive wildlife. Heading further east along the coast we’ll visit St George’s castle at Elmina. Originally built by the Portuguese as a trading post, it later turned into a holding fort ready to ship slaves across the Atlantic. A beautiful place yet one with such a tragic history. We’ll also have a chance to wander around the bustling fish market below the castle. After our visit to St George’s castle we’ll head onto Cape Coast castle to visit what was the residence of the British governor until Accra became the capital of Ghana. Again, the beautiful setting of such an impressive building pales into insignificance when you learn about the suffering that went on within the walls during the time of the slave trade. Next stop is Kakum National Park, where we’ll get to walk on the famous canopy walkways above the rain forest and the opportunity to see some of the wildlife within the reserve. The trip finishes after a final days drive into the Ghanaian capital of Accra. It’s well worth visiting the coffin makers just outside of the city, where the workers chisel timber into all kinds of objects to give people a final send off in style (cars, animals, rockets – you name it!) In addition, the artisans market has a superb array of masks, statues, clothing, jewellery, chess boards and chairs for sale if you feel the urge for some souvenir hunting! If time permits, it’s worth joining a tour of Accra with the excellent local guide Charles Sablah. 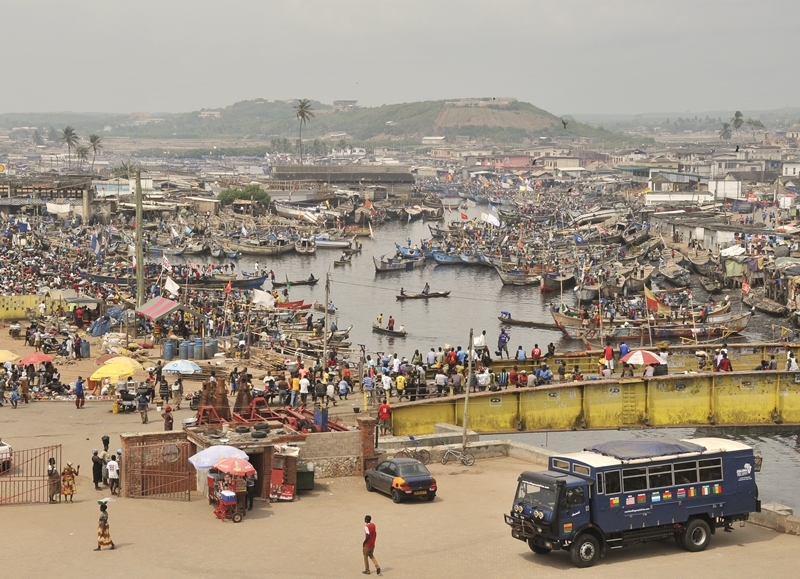 The impoverished suburb of Nima in Accra is his base and where he started his walking tours a few years ago, offering a chance to visit the kind of places that most other tourists miss out on. Ghanaian’s love to dance and party, so why not join in the fun and dance until dawn on the last night of this epic overland adventure! Check out this video Jamie Noel made for us, highlighting many of the great things detailed in this itinerary! 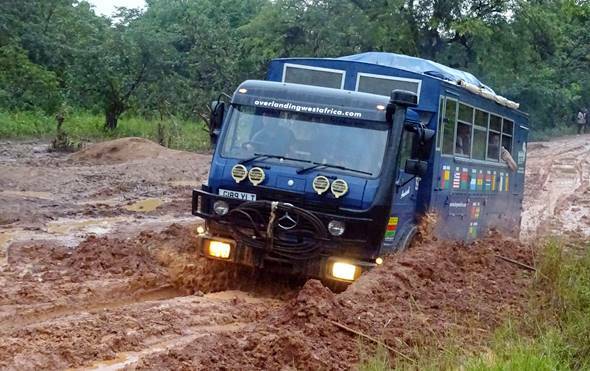 Please Note: This trip can be combined with our Dakar to Freetown trip and/or our Accra to Ouagadougou trip to make the ultimate West Africa Overland adventure!